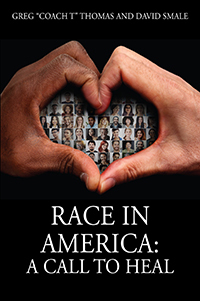 Greg “Coach T” Thomas and David Smale’s “Race In America: A Call To Heal.” It’s not a black and white issue; it’s an issue of the heart. Racism is an issue that is older than the United States itself and it still exists today. It might be better than it was 50 years ago but it’s still very real. It’s not a skin-color issue. It’s not an economic issue. It’s not a geographic issue. Those things are not the root of the problem.